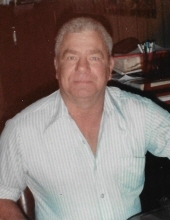 George Dwayn Givens, age 77, a resident of Perry, went home to be with his Lord on Monday, August 13, 2018, at the Perry Memorial Hospital in Perry OK. Care of the family is under the direction of Trout Funeral Home of Perry. George was born to Thurman Wesley and Irene Marie (Henson) Givens on February 22, 1941, in Cleveland, OK. George had a high school sweetheart that he fell in love with and married. Helen Ann Folsom and George were married on April 29, 1960. George and Ann had lived in numerous places before moving to Omega, OK in 1969. He worked for Boeckman Ford of Kingfisher from 1966 to 1977 and then he opened his own mechanic shop, Georges Auto in 1977. In October of 1980, George suffered a massive heart attack that forced him to shut down his shop. He was hot lapping a race car that he and his sons built when he suffered the heart attack. George was disabled, he had suffered four heart attacks in the next several years. Then to his surprise, he surrendered to God’s call to preach in 1989 at the age of 48. He served in several churches as fill in and revivals in the Kingfisher area. He was then called to serve as full-time pastor at Omega Baptist Church in 1994. George and his wife moved to Perry in 2004 while still serving where God placed him. Due to further ill health, it caused him to retire in January of 2007. George and Ann became full-time grandma and grandpa from then on. He was known by many as a Guru mechanic. Often able to diagnose and instruct how to repair a vehicle just over the phone. He was also known as a practical joker. Most of the family has a similar shocking story about him. When George’s health allowed him, he loved hunting, fishing, camping, racing cars with his brothers and his sons. Survivors include his wife Ann of the home; children: Billy and wife Sherry Givens, Derris Givens, Christina and Mike Chantnacran all of Perry; brothers: David Givens, of Perry, Jimmy and Rosemary Givens of Coffeyville, OK; sisters: Carol and Ron Barnes, Judy Winters and Peggy Crispin, all of Perry; brothers-in-law: Richard and Roni Folsom of Perry, and Frank Folsom of Bristow; sisters-in-law: Hope and Jim Sparks of Natural Dam, AR, Marta and Mike Rother of Kingfisher, Willa and Raymond Coker of Perry; his pride and joys (grandchildren) Jacob Givens of Perkins, Jared and Katie Givens of Perry, Jeremiah and Ali Givens of Perry, George and Norma Chantnacran of Perry; and numerous nieces and nephews. Preceding him in death were his parents, brother Everett Givens; sister Thurma Savoie; brothers-in-law: Larry Crispin, Verlin Winters, Bill Stover, Glen Folsom, John Crews; sister-in-law Sue Crews; daughter-in-law Jennifer Givens; infant nephews: Tracy and Troy Givens. To send flowers or a remembrance gift to the family of George Dwayn Givens, please visit our Tribute Store. "Email Address" would like to share the life celebration of George Dwayn Givens. Click on the "link" to go to share a favorite memory or leave a condolence message for the family.